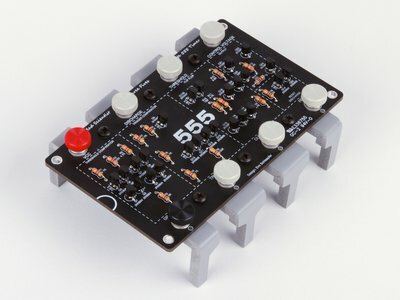 The “Three Fives” Discrete 555 Timer kit from Evil Mad Scientists is a transistor-scale replica of the ubiquitous NE555 timer IC, packaged as an easy to assemble kit. And by easy to assemble, I mean easy. The component values are clearly printed on the silkscreen on the board. I never once had to look at the schematic or parts list. In fact, I didn’t even look at the assembly instructions until it came time to test with the example circuit. The Three Fives kit is one of the easiest-to-build soldering kits I’ve encountered. It includes the circuit board, PVC foam legs, resistors, transistors, 8 color coded thumbscrew terminal posts, and assembly instructions. To build the kit, you will need the basic electronic soldering skills and tools: soldering iron, solder, wire clippers, and a Phillips head screwdriver. That’s it. Since the kit is the equivalent circuit for an NE555 timer, you can lookup one of the hundreds of 555 timer circuits freely available on the internet and implement them with spare parts. The only caution is that if you are using a power supply above 6.5V, you cannot connect the RESET pin directly to the 6.5V source directly; you’ll have to use a 100k resistor in between the connections. This entry was posted in Electronics, kits, Reviews on April 27, 2014 by Joe Turner.